500 pc 3D puzzle with glasses. All Life is Connected Scene. "Spellbound" by Myles Pinkney. TDC Puzzles. 3D Jigsaw Puzzle. This high quality jigsaw puzzle includes two pairs of 3-D glasses that will make for hours of in depth fun for the whole family. Put on 3D glasses - see the puzzle leap out at you. 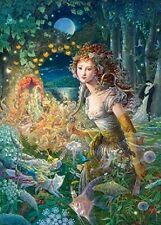 From an original artwork by Kinuko Craft. Wildwood Dancing. "Fun" and "Learning". Have Fun ! do not have to be mutually exclusive. Excellent Gift for Puzzle, Escape Room, Teacher Lovers! Pomegranate Frank Lloyd Wright: Saguaro Glass Designs 1000 Pcs Puzzle Complete! Pomegranate Frank Lloyd Wright: Saguaro Glass Designs 1000 Pcs Puzzle!. Condition is Used but in great shape and guaranteed complete. Shipped with USPS Priority Mail from a seller with 100% perfect feedback so buy with confidence. Springbok 500pc Puzzle" DANCE! DANCE! DANCE!" Uses-Completed-One Missing! Item: Hallmark Cards 500 Piece Jigsaw Puzzle. Condition: These are used puzzles from various yard sales. This Puzzle is truly Fun and Beautiful when put together! Details: "DANCE! Condition: Pre-Owned - Complete - One Missing Piece - Box in Good Condition. Eco-friendly soy-based inks on recycled board. Heritage Puzzles Tropical Treasures 550 piece 24" X 18" AMAZING 3D With Glasses. Condition is New. Shipped with USPS Priority Mail. The Puzzle Box is Signed in Red by Artist Robert Gratiot. Robert Gratiot is a Contemporary Painter who has a gallery in Denver, Colorado. He created the Original Painting "John Lennon Glasses in Cellophane #5. Includes 300 Interlocking Puzzle Pieces. Create a glow-in-the-dark jigsaw puzzle version of Hong Kong skyline by completing this 1,000 piece jigsaw puzzle by Tomax. 1000 Piece Glow-In-The-Dark Puzzle: Hong Kong By Night. It is made in Hong Kong. Jigsaw Puzzles. Stained Glass Butterfly. From an original work of art by Dean Russo. do not have to be mutually exclusive. It is 550 pieces and 18"x24" when finished. SPOT WHAT! 250 PIECE 3D JIGSAW PUZZLE WITH 3D GLASSES. 13" x 19". The Puzzle Box is Signed in Red by Artist Robert Gratiot. Robert Gratiot is a Contemporary Painter who has a gallery in Denver, Colorado. John Lennon Glasses in Cellophane #5 Jigsaw Puzzle: In Cellophane! Each Springbok Puzzle features 100% unique puzzle pieces that are never repeated. Made in the USA since 1963. Springbok Puzzles are manufactured with sustainable organic soy based ink & utilize 100% recycled materials. This shaped puzzle shows bears, foxes, and moose surrounding a nativity scene on a stained glass window of a church in the woods. Forest Nativity 1000 Pc Shaped Jigsaw Puzzle by - 1000 Piece Puzzle - Completed Size: 18x24 - Puzzle Artist: Parker Fulton - Eco-Friendly - Soy-Based Inks - Recycled Board - Made in the USA - Interlocking Pieces & Durable Construction. ERIC DOWDLE. MADE IN USA. 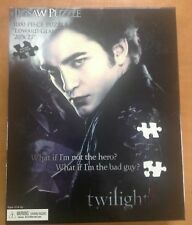 TWILIGHT 1000 PIECE JIGSAW PUZZLE "EDWARD GLASS" 20X27. Condition is Used. Shipped with USPS Priority Mail (1 to 3 business days). NEW 1000 PIECE JIGSAW PUZZLE MARTINIS. This 1000 piece jigsaw puzzle. new in the factory sealed, shrinkwrapped box in mint condition! Puzzle size is 400 x 600. Puzzle is new and sealed. The box is slightly indented on one side. Melissa and Doug stained glass safari. New and unopened. Purchased from an authorized retailer. Please see photo and use zoom feature to see items condition. Item will be packaged and shipped securely to ensure product integrity. Curacao Harbor (2011). Beautiful Stained Glass Windows (2013). Puzzle size: 18" x 24". This is a fun puzzle to put together since it is so colorful. They also make great gifts for kids and adults alike! Artwork by Randy Wollenmann. 1000 Piece Jigsaw Puzzle. These were manufactured to be used in the USA. Use outside of the USA at your own risk. 500 piece puzzle titled "FACES OF MARY" in stained glass. ITS IN GOOD CONDITION. SPR CLOSET SHELF. I WILL TAKE GOOD CARE OF YOU. Condition: NEW - pieces factory sealsed. Disney Stained Art Jigsaw Puzzle[1000P] All Stars Stained Glass (DS-1000-764). Contains 1000 Jigsaw Puzzle Pieces. Completed Puzzle ~ 51.2 x 73.7 cm. Product Features. MARTINI GLASS SHAPED. JIGSAW PUZZLE. NICE LONG SOAK. PUZZLE SIZE 20 X 29". Nightmare Before Christmas Stained Glass Gyutto Series Jigsaw Puzzle Tenyo. Item is factory sealed but box sides are crushed. Please review photos for more on condition. 100 Pc Jigsaw Puzzle. 3-D PUZZLE. Girls peace. Signs and hearts. Hello Kitty 3D Floor Jigsaw Puzzle. Finished puzzle is 3' x 2'. Includes 3D Glasses. This is a new / unopened Jigsaw Puzzle. "Corning Museum of Glass North Wing Expansion". The traditional Nativity scene is rendered in colorful stained glass on the beautiful puzzle. They also make great gifts for kids and adults alike! All of our signature jigsaw puzzles are made in the United States with recycled materials. No. 162369~No.162192. 2 Ravensburger Puzzles. However, most international orders do arrive within 3 weeks.